I’m not one of those smart bloggers who can plan ahead and say, I’ll save that one for Friday because I already have something to talk about for Thursday. This has always just seemed to me sort of like a little coffee klatsch with yarn thrown in. So I talk about everything all at once. Because that’s what I do when I coffee klatsch. Sometimes I’m sitting at the table knitting by myself (yes, I realize that means I’m talking to myself too). And sometimes I’m joined by a few friends. Every now and then it’s more like a few thousand friends. Using free blogging software and being my own webmaster: Worth every penny (ha ha). Being linked to (in the nicest possible way) by both Wendy and Grumperina on the same day that I boast about the completion of Clapotis #2 on the Mason-Dixon Knitting Slogalong: Priceless. Welcome visitors! Pull up a chair and I’ll pour you a cuppa. But the sudden 12-fold spike in bandwidth usage (sinking back now to its normal level of semi-obscurity) did point out the need for a few tweaks around here. I’ve been working long hours and what few blogging minutes I’ve had have been mostly spent in shoring up the framework. WordPress is really great software. But I sort of hack it around a bit. So PI is kinda held together with baling twine and bubble gum. I think the comments are working OK again, and hopefully the pages will load a little faster now. I added a bit more baling twine (knitted into I-cord) and propped it up with a couple of extra 2x4s. My cousin Margaret lives near Boston. For years she’s been trying to get me to come over to the right-hand coast for July 4th. Last year around Thanksgiving I told her that this year I would come for sure and she could plan on it and we were both really excited and I made arrangement to take the time off no matter what. And I kept thinking that really I should call her and let her know that really I was coming… really. There’s a 3-hour time difference. And Margaret and I both keep rather odd hours. I usually remembered to call her around midnight here, and I thought she probably didn’t really want to hear from me at 3:00 AM, even if it was with (hopefully) good I’m coming to see you news. But I kept thinking I really needed to call her. And I kept remembering at midnight. Me: Hi. It’s me! How have you been? Margaret: oh! How are you! It’s great to hear from you! Me: I’m great. How has your summer been? (Then, because I’m not sure if she remembers I’m coming and I don’t want to look really pushy and such if she’s got other plans) What are you doing for the 4th? Me: Would you like some company? And that was how I ended up planning to travel to the Boston area for a few days around the 4th. But I took extra vacation days, because I need them. Margaret was not sure she could find things to entertain me with. Although she knows, and I reiterated, that I don’t require much in the way of entertainment. Besides, as I told her, there’s probably a yarn shop or two in Boston. Margaret, who is a muggle (but a very much beloved muggle), said I think there’s one in Marblehead. 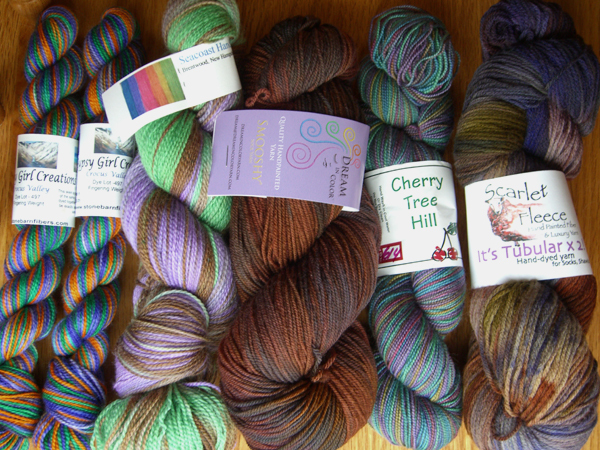 So, gentle reader, if you know where the best Boston area local yarn shops are, please comment so I can go armed with a list. 😉 Don’t know if I’ll be able to make it to any, but here’s hoping. 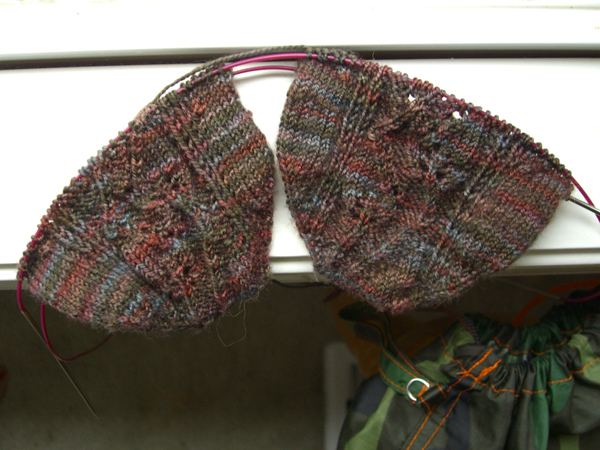 And here are the starts of the Java leaf socks for my Sockapalooza pal. I’m finding this yarn hard to photograph. Of course, it can’t be my skills as a photographer that’s to blame. It’s the yarn. (Right) So I plopped them right on my window sill where I’d get the best possible light. I wanted to start the leaf pattern right at the end of the toes. But I didn’t want lace all the way at the end, because I didn’t think that would be very comfortable. So I started with stems twining up into the leaves. There are two brioche stitches on either side of the leaf panel. I had planned on a knit/purl sort of diamond pattern on the sides, but as I knit up an inch or so I didn’t like the way it looked. It just wasn’t defined enough on the dark yarn. (It’s darker than it looks in this over-exposed picture.) So I laddered the sides back down and made them stockinette. I’m now planning to twine stems up the sides to the ankle, and have four leaf-panels around the legs, separated by the brioche stitches. And maybe brioche instead of ribbing at the top. The leaf pattern is a fun knit, though. Not so complex that I can’t do other things like watch TV, but still lace and complicated enough to keep my interest. And I think I mentioned that there might have been a little purchase from The Loopy Ewe to assuage my Blacksheep-Gathering-less self. I notice a preponderance of minty green, orange/brown, and purple. Hmmm… I don’t have much in the way of these combination in my stash. Well… just a little, maybe. I wonder if my color sensibility is shifting. Or maybe it’s the season.